To create an insulation package for the long term which will exhibit extraordinarily high thermal efficiency you need to use mineral foam. To make our mineral foam; dubbed 'the true eco foam', we mix magnesium oxide together with different kinds of minerals. It is dubbed 'the true eco foam' because it is both environmental friendly and non poisonous. This true eco foam is reputed for its ability to provide both sheer strength and efficient insulation because of the strength of the bonds between magnesium and oxygen atoms at the microscopic level to form a robust magnesium oxide molecule. 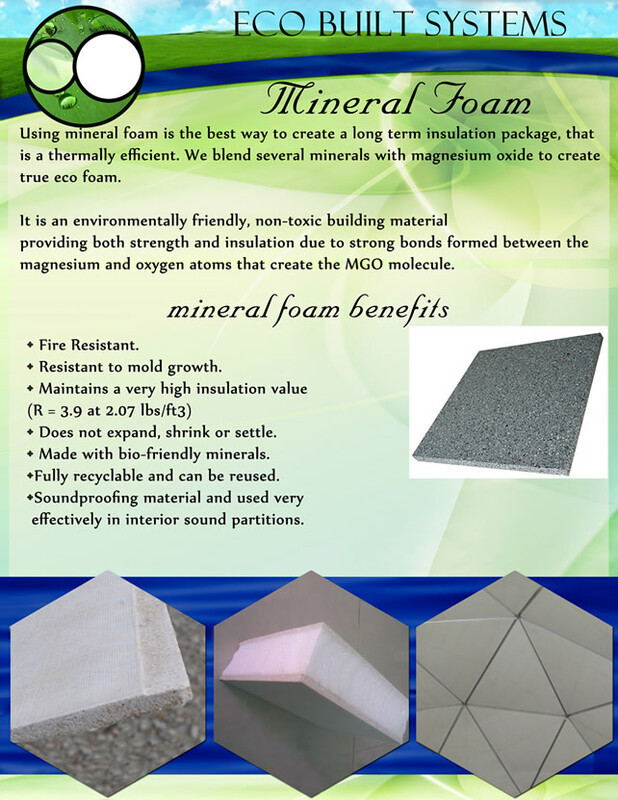 Mineral foam has a number of benefits that make it an essential building material. Its reliability in different environmental settings is as a result of its resistance to expansion, shrinking and settling. It also shows resistance to damage by fire and invasion by parasitic mold. It's extraordinary soundproofing capabilities makes it the preferred component to use in making interior sound partitions. Perhaps the main advantage of mineral foam is that it maintains a high insulation value. On the environmental front, it is made of bio-friendly minerals and is fully recyclable and can therefore be reused.